Launched on April 1, 2016, the Comprehensive Care for Joint Replacement (CJR) model is the first mandatory bundled payment program from CMS. Affecting more than 750 hospitals in 67 markets, CJR creates a host of new challenges and opportunities for participants. To ensure that they are getting the most from the initial CJR data feeds from CMS, hospitals must understand what can and cannot be measured, and take steps now to address any issues. Over the last few months, hospitals participating in CJR have had the opportunity to review their 2012 to 2014 baseline data. This data set provides an important comparison point, as it comprises two-thirds of participants’ initial targets and affords insight on a number of measures, including how often patients were discharged without requiring postacute institutional care, as well as infection and revision rates. However, participants should remember to take into account any changes in their care paths and joint replacement surgeons that occurred after this time period. 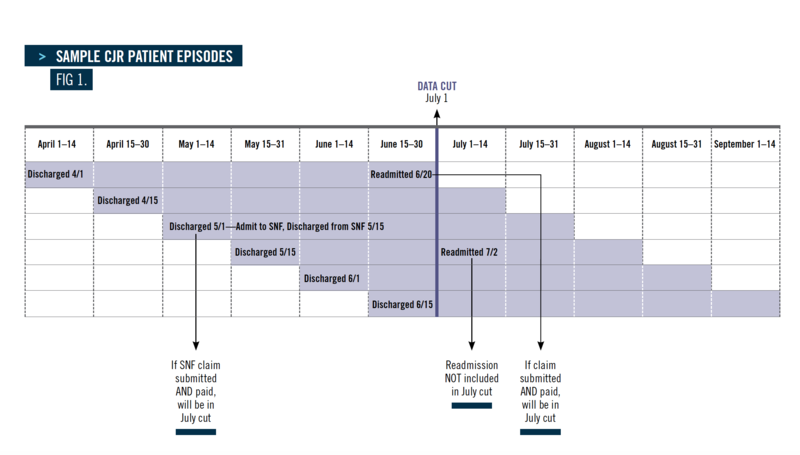 Hospitals are eagerly awaiting the first round of performance period data, due to be disseminated by CMS shortly after the end of the first quarter of the program. The first CJR data feed will chiefly serve to indicate how well the system is able to identify attributed patients. Participants should analyze these data to determine which patients were missed and, conversely, which patients were identified as participating in the program who should not have been included. Assigning the incorrect Diagnosis Related Group (DRG) at admission—when a complication or other significant diagnosis arises during the hospital stay, the patient’s DRG assignment upon discharge may change. This is particularly impactful when a patient is admitted with DRG 470 but discharged with DRG 469, with complications and comorbidities that entail vastly different target amounts. Mistaking fee-for-service patients for those enrolled in Medicare Advantage, who are excluded from the CJR program. Patients may convert to end-stage renal disease status midway through the episode of care. The hospital may not know that these patients have been excluded from the program until reconciliation. Attributing Bundled Payments for Care Improvement (BPCI) episodes to CJR—if 1 or more of a facility’s operating physicians participates in BPCI for joint services, the episode is attributed to the physician instead of the hospital. Because CMS may not identify these episodes until reconciliation, the hospital must institute measures to identify these physicians itself.